This member of the weasel family is the only ferret native to North America. They are 18 to 24 inches in length with short legs and large front paws for digging. They have a large head with strong jaws and teeth to consume their prey, which is almost exclusively prairie dogs. These nocturnal hunters may consume as many as 100 prairie dogs a year. They live in vacant prairie dog burrows and are solitary animals except in breeding season. The raising of their young is done exclusively by the females. The ferret’s food supply diminished rapidly as settlers moved into the 500,000 square miles of American prairies where the prairie dogs lived. The prairie dogs were considered pests and in the beginning of the 20th century they were poisoned to the point where only small, scattered populations were left. The population of the ferrets decreased proportionately. In addition to the loss of their food source the ferrets also suffered from the spread of sylvatic (bubonic) plague and canine distemper. The last known wild population of black-footed ferrets was in Wyoming. Some were captured to start a breeding program in 1987 which saved the animal from complete extinction. Extensive efforts of the U.S. Fish and Wildlife, state agencies and zoos have led to the ferret being reintroduced in selected surviving prairie dog sites with some success. 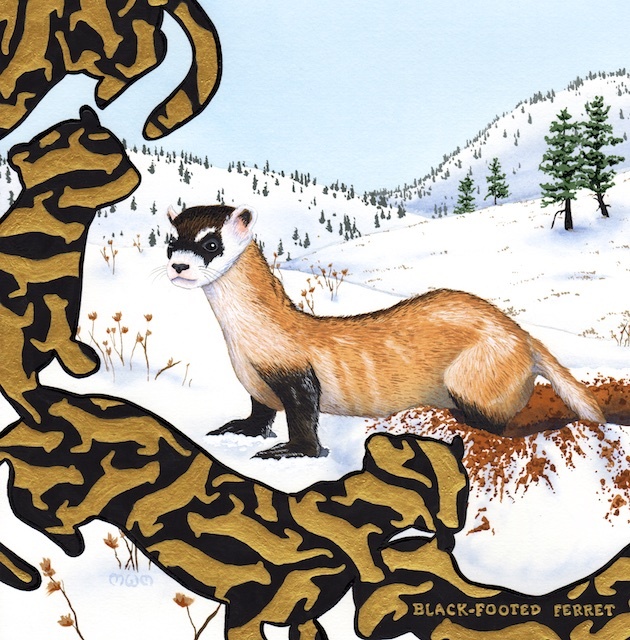 Goals have been set and strenuous efforts continue to further establish the black-footed ferret in the wild.